The Tennis Balls Photo. This has been claimed to have been taken by at least two different people on at least two different days. 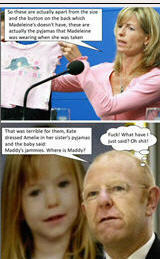 A careful analysis of the description given by Kate McCann of how the photo came to be taken seems improbable. 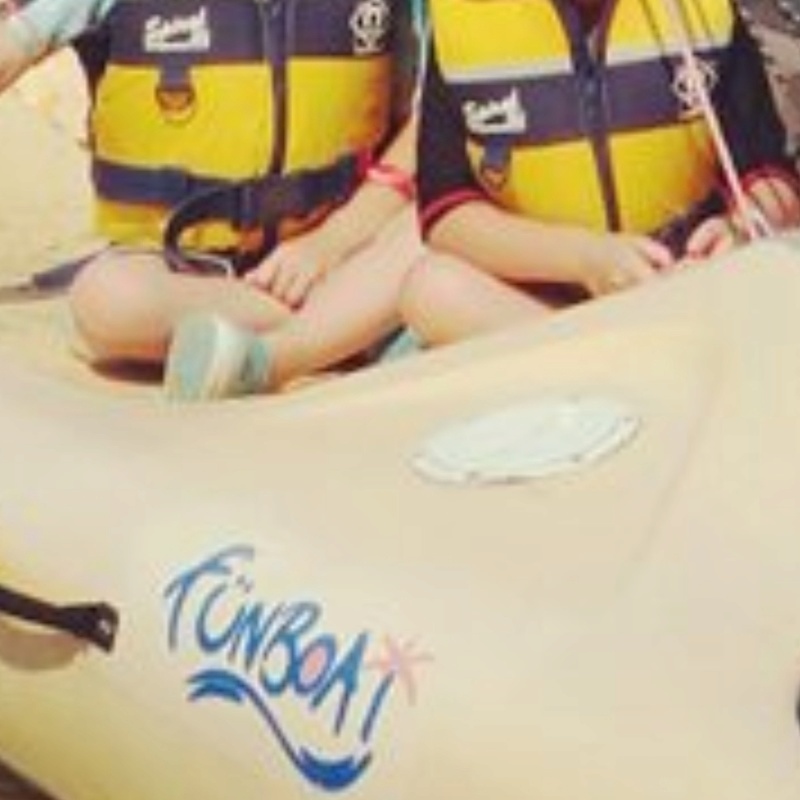 It therefore cannot be assumed to be a genuine photo of Madeleine taken on that holiday. In short we have four or five photos probably taken on Saturday and Sunday, but no confirmed photos of her after that. This is despite the family’s large collection of photos and videos and the fact that they had a digital camera on holiday. Our conclusion therefore from these six photos is that they tell a simple story; namely that there is no photographic proof of Madeleine being alive after Sunday. Elsewhere we and others have given detailed reasons for this conclusion. We are struck by the complete failure so far by anyone who still supports the claim that Madeleine died after 6pm on Thursday to bring forward any credible argument as to why we have no proven photos of Madeleine on any of the four days from Monday to Thursday. 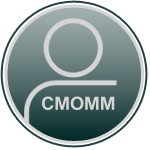 We seek the opinions of CMOMM forum members and guests as to whether our conclusion is reasonable – or, if it is not, why it is not. The first four photographs, the poolside and playground, I agree wholeheartedly. The other two, the make-up and tennis ball images, are inconclusive and therefore unhelpful. 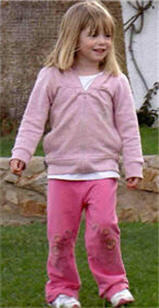 There is no evidence to suggest (oops, where did that come from) they are genuine photographs of Madeleine McCann taken during the holiday in Praia da Luz. If I may add to the stack of evidence indicative of Madeleine's 'disappearance' early in the week, sometime between Saturday 28th April and Tuesday 1st May, not only is there a total absence of photographs of Madeleine but also an absence of video footage of the holiday. As I've said a million times in the past - this is just not normal! In my view the absence of photographic imagery of Madeleine and/or her family, indeed also the rest of the group of friends, is far more important than vainly trying to prove when and where the two questionable images were taken, or how they came about. 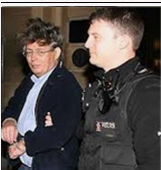 Snr Amaral wanted access to all their cameras - he didn't get it, instead he was handed a carefully selected few handed over by Gerry McCann and his cohort from Skipton, who incidentally wasn't even on holiday with the group. Even Kate McCann claims to have been frantically sifting through the memory of her digital camera whilst her husband was in another room being interviewed by the PJ, looking for that vital clue - allegedly. So, where are all the photographs that were stored on your camera Ms McCann Healy? Certainly not in the possession of the PJ who were searching for your daughter! Why didn't you hand them over to the PJ as asked, why did you hide them? 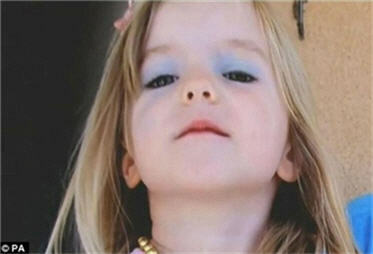 There is enough compelling evidence to suggest Madeleine met her fate sometime between Sunday 29th and Monday 30th April 2007. Sadly Madeleine was gone and the abduction plan was hatched long before the panic button was hit at approximately 10:00pm on Thursday 3rd May 2007. The PJ did have access to some photos &/or cameras, but which ones I don’t think we know. Would love to hear more from GA on this matter, hopefully in a second book if it materializes. I cannot believe that the images in the awful black and white and greyscale photos that were released in the PJ files are actual copies of the photos seen by them, and have surely only been published in this manner to give some privacy. Quite what they show and when they were taken could be very revealing as it could well be MM in some of the photos, but no one can be sure. Similarly, if she could be confirmed not to be in some of the photos that you could reasonably expect her to be in, that could speak volumes. Even some correctly timed and dated photos from later in the week showing/not showing the rain or even some sunny interludes during the day could sway our opinions, as we are relying on a fairly general weather forecast and the windsurfer photos from along the coast to pull the likely date back to the Sunday. Does KM’s camera story hold up? The cameras were floating around in plain sight. Did the PJ really not flick through the photos at an early stage or were they point-blank refused permission to do so? If so, 'why?' must surely be asked. I couldn't put hand on heart and say the Make-Up photo is a genuine photo taken during the holiday, as there isn't enough on show to confirm one way or the other. I think it is, and I stand by what I said on another thread, but sadly, thinking a thought isn't proving a fact. The Tennis Balls photo, all that space and not another soul in sight, not even a sweet wrapper. It could be anywhere, as long as anywhere is very clean and desolate. For all anybody knows. The tennis pic could have been taken anywhere. And not during the holiday week. eg Easter in the UK??? I'm interested to understand why you think this 'make-up' photograph is authentic. Apart from the many hands and formats it's been through, I have these observations to make..
1. The image is bland, there is no contour - no defined features. 2. The face lacks natural colour, coloration one would expect to see in a healthy lively child. 3. Put the image side by side with the photograph of Madeleine taken in the Ocean Club playground. The make-up image ages Madeleine by about three years. 4. The blue shading on the eyelids most certainly is not the play of a three year old child, nor do I think it was applied by an adult. It is not consistent with the use of eyeshadow by the modern woman. It's looks as though it's been smeared on in a splodge, without artistry. 5. Going with the idea a photograph was taken at Praia da Luz between arrival on Saturday 28th April and Monday 30th April - what opportunity was there? It usually takes 24 hours + to find your feet when holidaying in an unfamiliar place, probably more so with children. Where did the eyeshadow come from? I can't imagine Kate or Gerry McCann using pale blue eyeshadow - did they pack it with the sole intention of making-up Madeleine for an impromtu photoshoot within hours of their arrival at the Ocean Club? I doubt that very much! So again I ask - where was the opportunity? I fear this is just wishful thinking - trying to photofit a random image into an otherwise extremely persuasive argument that Madeleine McCann was not seen or heard of after Monday 30th April 2007. Personally, I believe there is sufficient evidence to lead to that conclusion without a flimsy backup to bolster the argument. In my view, it's far more likely that this particular image was enhanced by Jon Corner for the production of his 2010 anniversary appeal video..
"So beautiful, astonishingly bright, and I’d have to say very charismatic. She would shine out of a crowd. So—God forgive me—maybe that’s part of the problem. That special quality. Some ******* picked up on that." It's the only explanation I can see from the available evidence. @MRNOODLES wrote: For all anybody knows. The tennis pic could have been taken anywhere. And not during the holiday week. eg Easter in the UK??? We've done all this before (ah blessed memory hole). The photo was taken from an elevated position. The children's playground looking down fits perfectly. You can see the children's play area at the back. I think the tennis photo was taken early in the holiday when Madeleine would have been excited by picking up armfuls of tennis balls for the first time. I will reword what I thought I had said. I cannot put my hand on heart and say that photo was taken on the holiday, because there is not enough of the surrounding area shown in the photo to determine a location. I agree with the points you made about the make-up being artistry, in fact, I made the same conclusion on another thread quite some time ago. However, on that occasion you didn't agree with me. However, whether it is real make-up which has been smudged in Photoshop or enhanced as you term it, or simply a complete digital make-over without any real make-up having been applied at all, I cannot tell. If any of that is wishful thinking, please point it out, as it all seems to tally with your current position. Also Verdi, your point #4......if not applied by a 3-year old or an adult, are you therefore suggesting by an older child ? If so, where has that supposition come from ? @polyenne wrote: Also Verdi, your point #4......if not applied by a 3-year old or an adult, are you therefore suggesting by an older child ? If so, where has that supposition come from ? @Verdi wrote: In my view, it's far more likely that this particular image was enhanced by Jon Corner for the production of his 2010 anniversary appeal video..
And I will repeat exactly what you did say, I quote..
@JRP wrote: "I couldn't put hand on heart and say the Make-Up photo is a genuine photo taken during the holiday, as there isn't enough on show to confirm one way or the other. I think it is, and I stand by what I said on another thread, but sadly, thinking a thought isn't proving a fact." My apologies if I misunderstood, you said you couldn't put hand on heart to say the make-up photo is a genuine photo taken during the holiday - but you think it is. I took that to mean although you couldn't prove it, you think it is genuine. I don't have any recollection of disagreeing with you on the subject on another thread. If you could give me a link to the conversation, I will gladly offer an explanation - I never say anything without reason. It could of course be a change of direction, I'm not impervious to altering my point of view given on any minor point relating to the case. The wishful thinking comment was not directed at you in particular. ETA: If the 'make-up' image has been photoshopped then it's not a genuine photograph - surely? I'm getting mixed messages here. A Photoshopped image cannot be genuine, apologies for saying "genuine", that was a bad choice of wording and was misleading. The image in my opinion is Photoshopped in the following areas. On another thread I said that the area to the left background has been sprayed black, and the area of her hair on both sides of her neck has also been sprayed black. Also the item on the wall has been blurred. I still think that the item on the wall is a thermometer, and the blue item is a paddle. Despite jokes about Thermoman, by the way, I still stand by what I said. Edited to add, yes I think it could have been taken on the holiday, Sunday afternoon, or early evening. I agree Verdi, she look's older on "The make up photo" than a 3-4 years old girl. 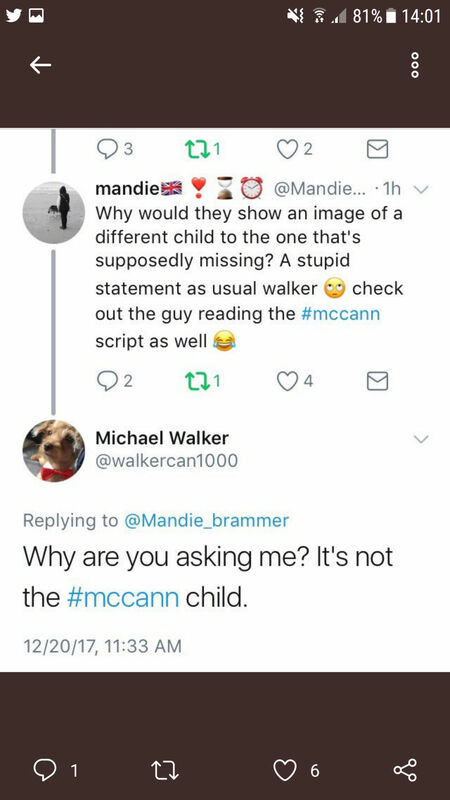 "This is not the McCann child". 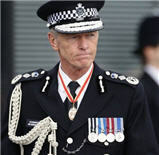 But the photo was on GM's blog and it was on SkyNews at May 17, 2007. Back to the "make up photo", you said she could be 3 years older", this photo was realeased back in 2010 and that's three years from 2007????hmm?? @JRP wrote: Despite jokes about Thermoman, by the way, I still stand by what I said. Thermoman was a dig at Operation Grange, not CMoMM or it's members . If you have valuable authentic information to impart for the benefit of CMoMM, it's members and guest readers, would you please say whatever it is, rather than dishing out hints. Innuendo is meaningless, unhelpful and damaging to the forums reputation. Please also be mindful that the forum is watched - caution is paramount. Tuesday 1st May 2007 - everything changed.. Yes, you are right, as has been said time and again - Madeleine is holding standard tennis balls, NOT tennis balls designed for use by very young children! Besides, Ms Healy said she ran back to the apartment for her camera to capture the moment in time. Did she tell Madeleine to 'hold that pose' for a few minutes? We've heard before about the new Gap outfit bought for Madeleine's holiday, now we have a pair of sandals to add to the wardrobe. This story about the tennis ball image It's a blatant devious lie. Question is why. 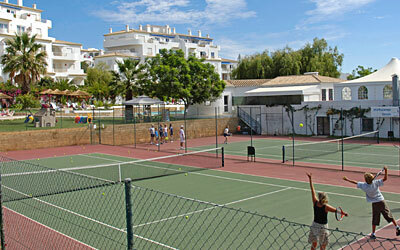 To place a living healthy Madeleine at the tennis courts on Tuesday 1st May perhaps? 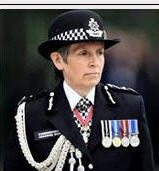 If it be true, why didn't Ms Healy or her husband hand the photograph to the PJ, it would have been far more useful for identification purposes than the outdated image they coughed up from somewhere. You might wonder why I raise the subject again! 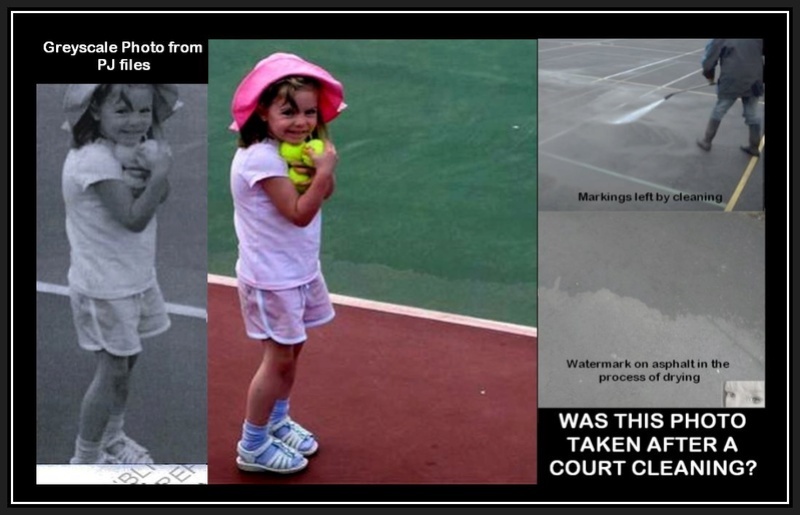 Because the 'tennis ball' image is questionably one of the few taken at the Ocean Club and is being used to determine evidence of the time of Madeleine's 'disappearance. So far it has been deduced that the few images were most likely taken on Sunday 29th April, working on that summary, Madeleine must have changed her outfit from the shorts/t-shirt new holiday sandals to the new holiday Gap outfit worn at the poolside to the scruffy pink outfit and trainers seen in the playground photograph to the beads and make-up image. To confuse things further, one should take into consideration the witness statement of the cleaner who describes yet another outfit. Something doesn't add up. Personally, I believe the only photographs worthy of notice are the poolside and playground photographs - the others are too contentious to lead anywhere constructive. I cannot say with any specific conclusions as to WHICH day she died... Only that SOMETHING likely happened before Tuesday and after she was seen by Fatima on Sunday afternoon. Whether she died before Tuesday or became fatally ill and died another day and was therefore not seen in public (at least without any proof) I really cannot identify a specific day of death. I have no thoughts on the Makeup pic (except it troubles me) but I have found nothing to support it was taken on the holiday. (maybe it was...I don't know...but until I find something to support it, I prefer not to comment) I can't imagine a contrived pic like that taken on the first day of the holiday... beads and blue eyeshadow are not something I could imagine being in their luggage and brought out the first day. 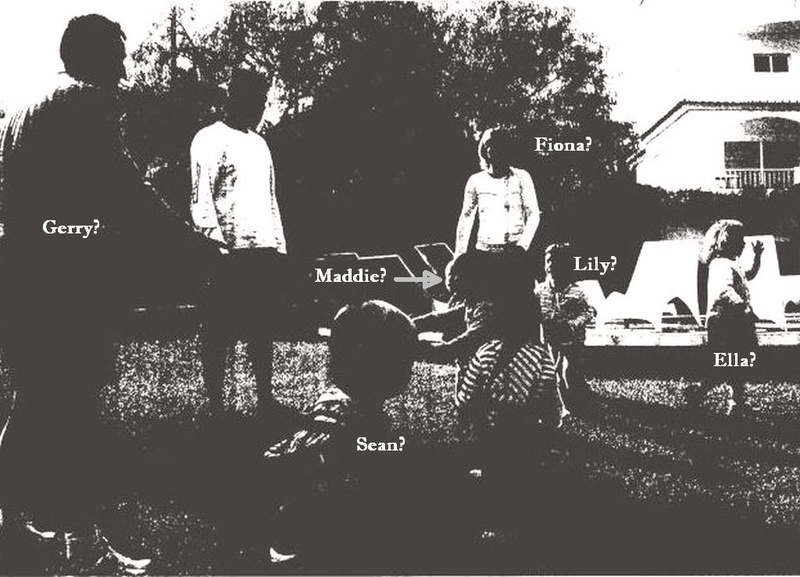 Not confirmed but it appears to be Maddie in one of the black/white playground pics. After the files were released in 2008 I was able to put together comparison statements to highlight the discrepancies. At that time it became clear that many of the statements contradicted each other. From what I could determine from the research, there seemed to be nothing to 'prove' that Maddie was seen during that week. The statements seemed to indicate, to me, that there was something being hidden about the activities during the holiday. I felt from the start (2007 as per the SOL articles that ultimately were similar to the files released) that something happened earlier and Wednesday seemed to be the day something happened. Early 2010 I was inspired to research every statement given that indicated they SAW Maddie to give a possible day that something happened after. I wasn't loking to disprove their statements.... I was only looking for some kind of reasonable PROOF that would indicate she was seen, and that may help me determine when something happened. 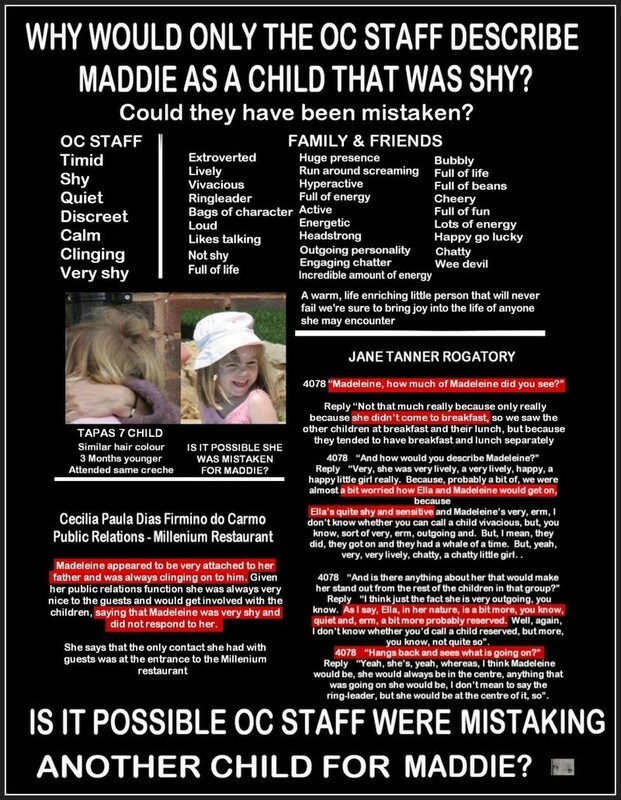 I studied EVERY statement and discovered that it was obvious that some of them were mistaken or non specific but I felt the tennis coach was the last one to indicate Madeleine was seen on Tuesday morning.... UNTIL I read the statement thoroughly and realised she didn't actually claim to have seen Maddie... only that she was one of a group of children and was likely she was claiming this from the tennis records as opposed to specifically remembering seeing her. In 2008 I had determined SOMETHING happened to Maddie prior to 5.30pm on May 3rd but I had no indication WHEN....apart from my deduction that if the discrepancies and contradictions started Tuesday morning, then it appeared something was being hidden and maybe something had happened before Tuesday morning. PLEASE NOTE... The following video describes the discrepancies and associated statements below in detail. 4) Goncalo refers to the bruise on Maddies arm....Kate claims that the mark on Maddie's arm was a sunburn. 5) Rachael was asked by the police, which court Maddie played on... she answered court 1 on the left side, but according to tennis records it showed the adults played on court 1 and mini tennis was on Court 2 on the right. 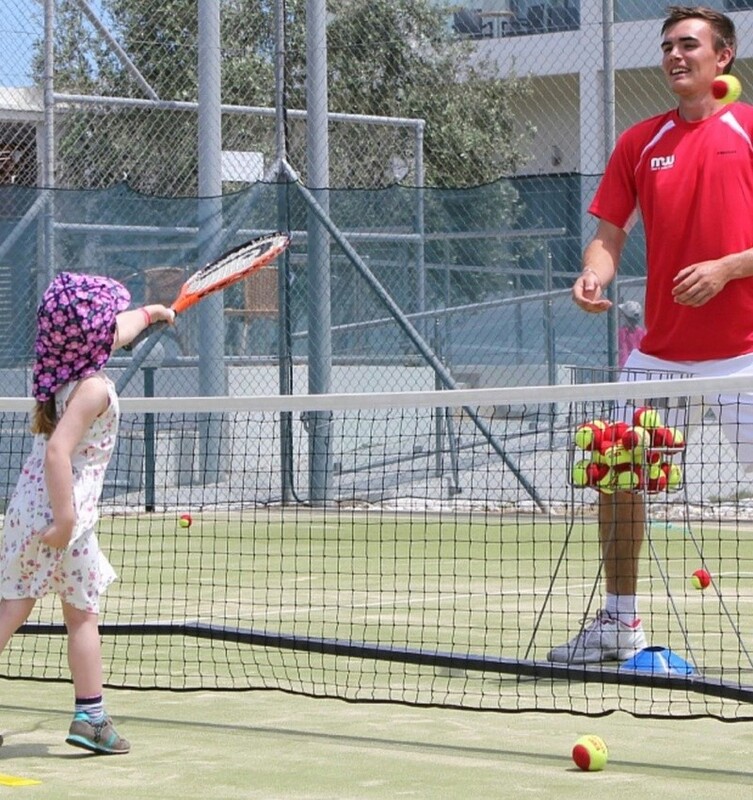 6) Rachael claims it was the LAST TIME she saw Maddie and that mini tennis was THURSDAY! 8) Rachael claims GERRY was there with them at mini tennis... Gerry was supposedly having his lesson on Court 1 until 15 minutes AFTER the mini tennis was finished, so COULDN'T have been there! She specifically claims that Kate, Gerry and Jane were watching Maddie play mini tennis. 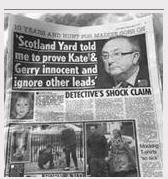 9) Kate claims she was there with Jane.... no mention of Rachael or Gerry. 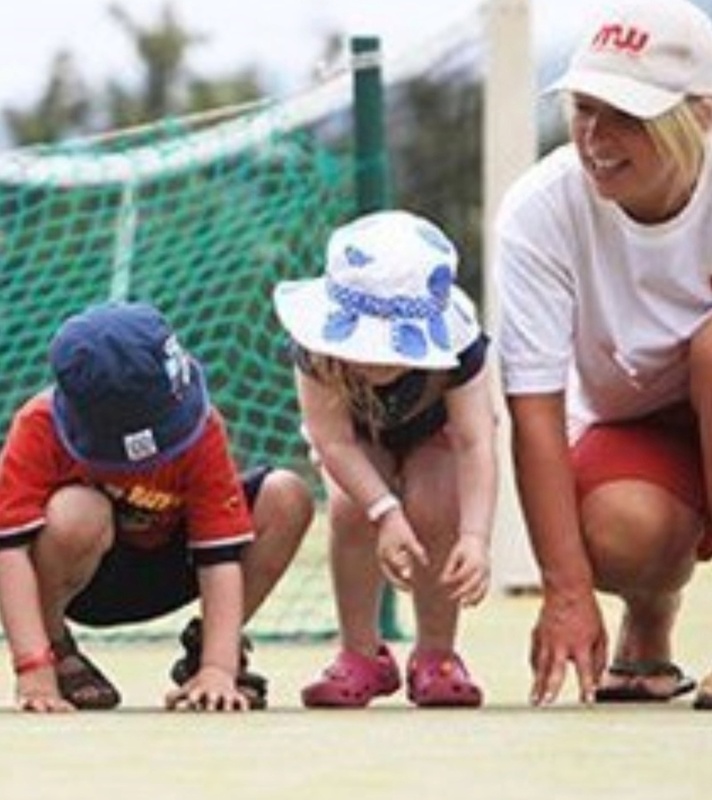 10) Kate claims to have gone back to the apartment after her tennis finished at 10.15am to see the maintenance men in her apartment though Rachael claims she was sat with Kate from 9.30 - 10.0am until mini tennis children arrived. IF she was at mini tennis on Thursday it was the SHARKS group (same ages as Maddies LOBSTER group) and...because she was NOT there at Maddie's group 'Lobsters' mini tennis on Tuesday (if indeed any of them were there) she thought that the group playing on Thursday was Maddies group and claimed to have seen her. 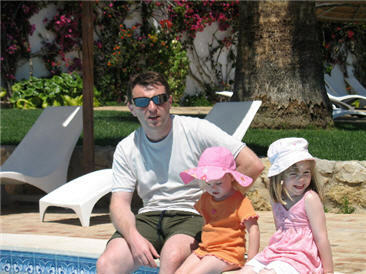 If NEITHER of them were there... then is this an indication that the McCann family were NOT at the pool at 2.29pm as claimed and Rachaels statement was merely to place Maddie being seen Thursday (at the wrong mini tennis) and Janes statement was to 'prove' the last photo being taken on Thursday lunchtime? My thoughts question the watermark and whether it was taken after a rain or more likely a court cleaning which was done at lunchtime AFTER mini tennis. To add.... New holiday sandals.... I tend to believe that as it was end of April and likely bought that year and worn at that time. The size would have been a lot smaller if from a previous year so probably a photo from the holiday. We can clearly see a brightly coloured kids Club ID bracelet in pink, on the right wrist of the small blond child on the sky news picture. I understand that all of the little nursery kids had to have an ID bracelet with their name and allergies. This was a standard Mark Warner nursery registration and induction procedure. 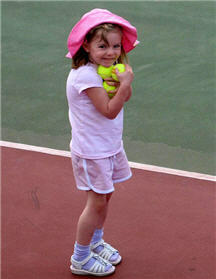 there is NO ID bracelet on Maddie in the tennis balls photo. So where is the bracelet or was she not registered? @Cammerigal wrote: We can clearly see a brightly coloured kids Club ID bracelet in pink, on the right wrist of the small blond child on the sky news picture. I understand that all of the little nursery kids had to have an ID bracelet with their name and allergies. This was a standard Mark Warner nursery registration and induction procedure. That is an excellent point which has been only briefly noted in the past. Catriona Baker made a point of mentioning the Mark Warner statutory children's identification bracelets in her witness statement..
Catriona Baker wrote: They brought the children and as it was their first day of holidays the normal procedure was that they were allocated a childcare worker. I had previously written the children's bracelets which included their name, allergies and relevant information. Normally a young child would be really excited about having their own special bracelet - most probably even wanting to wear it at night! There is no known photograph or image of Madeleine wearing a bracelet. That goes with what I think about the time the photo was taken. Which is really early in the holiday (before registration). (the bracelet could be on her left arm of course). You can see her left arm on the pool photo, no bracelet. You sadly can't see the left wrist in the tennis balls photo. Yes I know, that's why I said you can see her left arm on the pool photo! @BlueBag wrote: You sadly can't see the left wrist in the tennis balls photo. The bracelet should been visible on that wrist because this kind of bracelets are wide to get all the info to fit on it and the part of her wrist that are closest to her hand is curved and this kind of bracelets are not flexible.